Mobile Links has a long history in satellite operations and can deliver your required solution in a professional package. Currently we have ten SNG’s in our fleet strategically positioned in the capital areas of Sweden, Norway and Denmark together with facilities in other operational areas for quick response and good local knowledge. We are regularly traveling throughout our region including the Baltic countries and the rest of Europe. We offer satellite transmissions in any of the common compression formats, resolutions and modulation schemes. For your more complex operations we can also provide solutions for multiple carriers and can multiplex several signals. 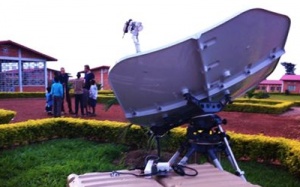 For sensitive receive operations we do also have up to 2,4 meter receive dishes. The majority of our trucks have been equipped with the latest 10bit H.264 encoders and possibility for modulation up to 32 APSK and in a fully redundant configuration. The fleet is also having fibre systems on board to handle cable runs up to several hundred meters, a very helpful solution when the truck needs to park in a complicated area, or bringing in a signal from an interview area at arenas. In addition to our well equipped trucks we’re having all components spare in our warehouse as well as special equipment. We also have instant access to cameras, disc recorders and VTRs if needed. At many occasions, fiber is the first choice for media distribution. Being operational in Scandinavia means that we have a very well built fiber infrastructure which often gives us a great opportunity to offer an alternative to our SNG trucks. 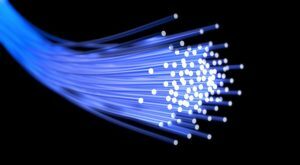 We have set up many different types of communication via fiber over the years. It has been as the transmit path for unilateral coverage from international sporting events to point to point links within a city. Mobile Links has instant access to both national and international networks for media contribution. 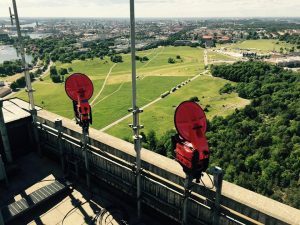 In Stockholm we’re connected to the most used production locations and offer high capacity internet connections for events, uncompressed and compressed TV signals and voice communications to production and media companies. Our connection nodes are placed in underground data centers with the highest security. 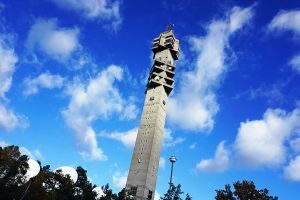 With outstanding connectivity to media companies in the Nordics, Teracom’s “Kaknäs” tower are the media hub of Scandinavia. Mobile Links are operating all occasional-use services at its facilities which are specially built for this purpose. With the “Kaknäs” tower as a core for teleport services, we are prepared and ready for any challenge in todays media delivery process. And we can offer a full-service product including satellite capacity. Live video over bonded 3G and 4G. Anywhere and anytime. Together with Mobile Viewpoint we offer easy-to-operate, light weighted devices which meet the requirements of today live video capturing. All encoders utilizes bonded IP networks, including 3G/4G cellular wireless networks, Wi-Fi, Ethernet, BGAN and satellite. It can be used as on backpack solution, in a news gathering vehicle or from your own smartphone. The portfolio includes decoders and a web based management tool, the Linkmatrix, to get your content on any destination you require, either your broadcast facility, or Social media platform. It can all be managed and monitored centrally with just a click away. We offer both rental or sale of the units. If needed, we can handle the incoming signal for you and forward it to any destination over satellite, fiber or to a specific CDN. 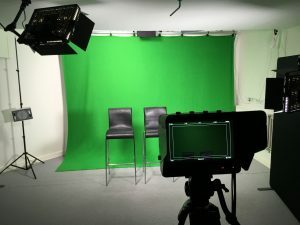 We can offer camera crews along with our SNGs for live stand-up transmissions, for shorter news feeds or longer events. We provide the camera man and equipment: HD/SD camera, ear-piece for IFB, different microphones like wireless, lavalier or handheld along with lighting. We can also book all sorts of satellite capacity for your transmission – such as Thor 10-02, Astra 3B, Astra 4A, Eut 10A or Eut 7A. There are occasions when microwave is the better choice to both satellite and fiber. It could be very remote areas during longer transmissions or maybe a reception point for a helicopter shot. No matter if you need an IP network for wireless internet in a campus area or a video signal transported from a mountain top, we have both the experience and the equipment. When the transmission takes place from a remote location where it’s easier to fly than drive, Mobile Links offer fly away systems for satellite transmissions. We have experience from both hottest Africa and coldest Greenland. 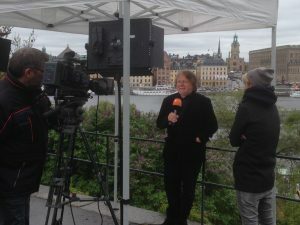 Located in the middle of Stockholm our studio is the perfect choice for live-interviews, stand-ups and other minor news. Our studio facility is a fully equipped HD television studio situated on Strindbergsgatan 32 in Stockholm. 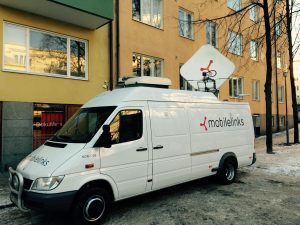 Mobilelinks manages the studio, providing equipment and technical support for the facility that comes equipped with full HD camera capability, a chroma key green-screen wall, a production control room and bi-directional broadcast connectivity to both Kaknäs Tower and BT Tower as well as fiber and traditional IP connectivity. The studio is easily accessible by car or public transport (nearest subway stations are Stadion or Karlaplan).